Seeing a show like BikeFace at the Toronto Fringe Festival 2018 is rare. A show where the audience is engaged and excited, the performer is enthusiastic and charming, and the crowd walks out ready to take on the world. A show like Trailblazing Ladies‘ BikeFace is very rare, indeed. Performer Clare Blackwood takes the audience on a journey, both across Canada and into the life of writer Natalie Frijia, who once put her PhD on hold to bike across the country — instead of reading about explorers, she wanted to be one. The story starts in Halifax, where she dips her bike into the ocean before setting out on a journey with a spaced-out, hippie companion who does not last long: his idea of a bike ride is a leisurely pace where you chat about meditation practices. Using different voices and a change in posture, Blackwood embodies each character she meets, from the aforementioned hippie to a New Brunswick lumberjack, a Quebecois retiree, and a quirky old man in Saskatchewan. Her energy and charisma carry the show, earning every laugh and bringing every unique character she meets to life. At times, BikeFace is a love letter to Canada, as our protagonist visits each province and discovers what makes them unique, minus Alberta and Manitoba, which aren’t interesting enough to garner more than a mention. The rant about Ontario mosquitos goes over quite well, naturally, as does the story about having a bike stolen while living in Toronto — many of us can, unfortunately, relate. But BikeFace is primarily a love letter to biking, and how it makes her feel strong, ambitious and free. 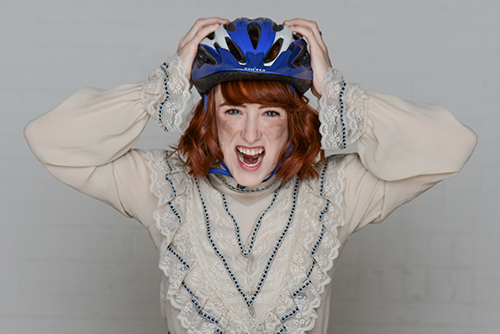 Throughout the play, there is a voiceover of an old Victorian letter about the dangers of letting women bicycle, telling us that women will become hysterical, crazy-eyed, and undesirable if they ride a bike. But it’s not just the past that’s sexist about women cyclists. Across Canada, she meets men who taunt, leer, and worse. Each time a friendly stranger takes her in, she worries that, as a woman travelling alone, she’s about to get murdered. As a child, she lamented a lack of female adventurers, but as an adult, she’s learning why they are so rare. While the show doesn’t shy away from the darker moments, and Frijia’s story is open and vulnerable enough to let us into them, it’s still an uplifting and empowering story. A woman on a bicycle isn’t the end of the world like the Victorian’s first worried about, or the rare sight that many passersby comment on. She’s just a woman trying to be fearless, have fun, and live her life. BikeFace ends with Blackwood pedaling furiously onto the next adventure, and that feeling of empowerment and wanderlust echoes into the audience. As we exit the theatre, I hear a man say it made him want to take up biking, while a pair of women discuss how they’ve always wanted to hike up to North Bay. I don’t think the show could get a better review than that.